One of the biggest problems ever present in the average Nigerian community is that of electricity supply. In most places, power supply is very epileptic, so much so that it cripples economic activities. The government of the nation has continuously failed in its promises to deliver stable electricity supply to the people, and so the people have resorted to generating their private power via mechanical generating sets, which cost a fortune to acquire and much more to maintain. These developments create a big vacuum for those people who cannot afford to purchase their own generating sets as well as keep them running. Worse still is the case of some communities which cannot boast of a reliable transformer to meet their electrical needs. Such communities are left in a world of their own; which is primarily a world of darkness and lack of access to electricity supply. In a bid to fend for themselves, these communities have to organise themselves to form a unit and thrive to pull funds in order to purchase their transformer. The realisation of the fact that these transformers actually cost a fortune effectively puts an end to their quest to acquire them. Finally, the last resort; which will only apply to those who are fortunate enough to have the opportunity is to appeal to well-to-do members of their community who can afford to purchase the transformer for them, and have the track record of philanthropic propensity. The above scenario played itself out recently when members of the sleepy Bolorun-pelu neighbourhood of Ikotun-Egbe, Lagos, came to thank Prophet TB Joshua for his philanthropic activities that have ensured that they would cease to live in darkness and enjoy the benefits of accessibility to constant electric light. Thursday October 2009, was the day. Members of the community were greeted with a very loud sound that emanated from the electrical transformer at the entrance of their community. The loud sound signalled the disruption of regular electrical supply to the community. 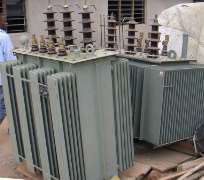 Immediate efforts were put in place to ensure that the transformer was restored to its previous functional state; efforts which ended in futility. At this point, the community leaders decided to table their plight with their benevolent neighbour, Prophet TB Joshua, whose characteristic charitable gestures have endeared him to many. Originally, the community was using a single transformer. This was the primary cause of the collapse of the transformer, as it was unable to function for the community due to overload. Representatives of the community converged at The Synagogue Church of All Nations to inform Prophet TB Joshua of their predicament and appealed for his support in their quest to purchase a new transformer. Responding to their appeal, Prophet TB Joshua reiterated that he saw the community as his neighbour and would ensure that he loved them to the best of his ability and put smiles back on their faces. He promised to purchase two transformers for the community and ensure that they were both installed. On Monday 21st December 2009, a large number of the community members turned out at The Synagogue Church Of All Nations to create a carnival-like atmosphere as they came to thank Prophet TB Joshua for purchasing and installing two transformers for their community. The spokesperson for the group recalled how the whole episode began. At the end of the ceremony, Prophet TB Joshua instructed that each member of the community that came out on the day be presented with a bag of rice for the celebration of the yuletide. In addition, the leader of the community was handed the sum of N 300, 000 cash for the purchase of a live cow for the members of the community.